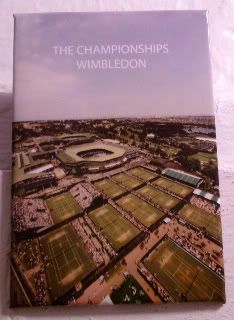 My sister brought this back for me from her tour of Wimbledon a couple of months ago. How timely. Seriously, boys. How do you play for eleven hours, five minutes. Across three days? Never-ending tennis. They broke pretty much every record in tennis you could think of. Though, really, all I thought of, after he got off the court was, whoa, that John Isner is hot. And he has to play again. Today.